When we rather fancifully wrote a column about storage system management by chatbot, and added the idea of an Alexa-type, speech-recognizing front end, we thought we’d left the back of our envelope far, far behind. Turns out we hadn’t. Tintri has been working to develop a chatbot for storage admin staff. The chatbot project has progressed to a demo facility on a smart phone, and you can watch a couple of videos about this. And it now seems that the Alexa front-end idea is actually not that crazy. Even Starbucks is getting in on the act, with customers talking to a device to present their coffee order. It’s launching a Starbucks Reorder skill on Amazon’s Alexa platform, and using Starbucks Mobile Order & Pay technology. 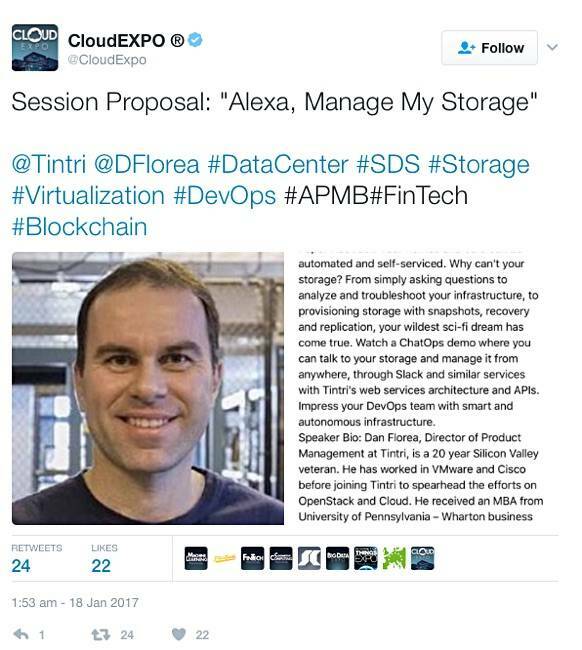 According to a Cloud Expo tweet, Dan Florea, Tintri’s director of product management, has suggested a Cloud Expo USA session in June looking at Alexa and storage management. So it appears Tintri is working on an Alexa integration, with the aim of having admin staff talk to their Tintri storage and manage it from anywhere – through Slack and similar services – using Tintri’s Web Services API.